An amazing odyssey across time and space to solve a riddle in a mystery in Gary's garage. “What year is it?” I said, rubbing my eyes. “I have to get to work.” I swung my legs out of the bed and almost fell to the floor. Instead, I found myself floating back into bed. I was wearing a mint-green jumpsuit. “Slow down,” he said. “You’ve been in Vaccu-sleep for centuries. You need to give your legs some time before you can walk. Until then, I can levitate you around with this futuristic device.” He held up the device. It looked exceptionally futuristic, far beyond my powers of describing devices. “I’m stunned,” I said. Indeed, I was. He started talking about who he was and how he was going to help me adjust to this new world. How much had changed on the planet Earth and so-on and so-forth. I stopped paying attention. The last thing I remembered before waking up to the man in the silver jumpsuit was going to the garage to start the car. I was several thousand years late for work. They were probably going to be bent out of shape about that. My wife might be pissed too. I started working on my excuses. “I’m sorry that everyone you know is dead,” he said, bowing his head. “That sounds terrible,” I said. He kept talking about all the future what-not’s. I wasn’t sure if it was the right time to discuss the replacement wife. I kept picturing a noisy robot replacement wife and getting worried about interlocking metal gears. That was when I realized that I hadn’t quite gotten his name. I knew he said it. It was like, ‘Splort,’ or something. I felt bad. I didn’t want to backtrack and look like an idiot. I hate sounding stupid. “Can I call you ‘Captain Future’ from now on?” I splorted out. “That sounds persimmony!” he shouted. “Great,” I said. “Hello, Captain Future and the world of the future. So long, 1985!” I did a little dance. It felt strange, because I was levitating. And because there was no music. I was starting to think that Captain Future saw some kind of a problem. “Hmmmmmm. Also, mint-green jumpsuits were all the rage in the year BDBDBDX. Hmmmmmmm. There’s only one thing to do,” he said, pointing a finger into the air. “Oh, nothing,” I said. “It’s just a word we used in 1985.” He levitated me over to the time machine in the corner. On the outside, it looked like a British phone booth. On the inside, it looked very much like a British hotel room. “I’m sorry it’s so small,” he said. “You call that a television?” I muttered. “What happens to Trump?” I asked. “You’ll see. PREPARE FOR TIME JUMP!” he shouted. He shrugged and pressed a button on his levitation device as we opened the door to the excruciatingly small machine. As I floated down to the ground, my legs gave out and I fell through the open door, right into some fat weirdo hanging out in my garage. “I don’t think your legs work yet,” said Captain Future. “Geez. Okay.” I stared down at my limp, bloated body. I was unconscious. The other me, I mean. I myself was conscious, just not him myself. “Hey. Couldn’t there be some kind of an explosion or something? Being in the same place at the same time? Me and him?” I said, pointing to my lifeless mass on the garage floor. “An explosion? Wow. I hope not. So far so good anyway,” said Captain Future. “I don’t think we should wait too long. Why don’t I take that Gary to the year BDBDBDX for Vaccu-sleep, and then you can just go to work?” Captain Future put his hands out in a ‘what-do-you-say’ gesture. “Just switch the clothes. Please.” It was hard to say no to Splort. “Yes,” he said. “There is.” We put the other me in the jumpsuit and dragged him into the time machine. It was like trying to stand up a garbage bag full of apple sauce. 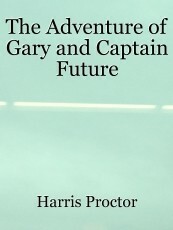 “Gary,” Captain Future said. “I like ‘goodbye’ better,” I said. With that, the time machine doors closed. It shook and disappeared with a ping. I stood there, naked, in my garage for a moment contemplating the expansiveness of space and time. Then I realized I was late for work. Absolutely wonderful, this was very funny, and amazing. What a time to be alive! I really liked your story,i loved the idea of a robot replacement wife omg! Oh my! Honestly, this is probably the funniest story on the entire Booksie! This is humorous sci-fi at its best! Seriously, if it were signed "Robert Sheckley" I wouldn't be surprised! Brilliant, simply brilliant! I'm so envious of you, because I write humorous sci-go as well... but not as well! :-) You see, this was my lame sense of humor :) This goes on my shelf right now! Thanks for your time, your kind words and your shelf-space! Good story. Let me know how the robot wife compares to the real thing. That ending was brilliant; it doesn't entirely answer how he ended up in that future year but it does kind of give suggestions. I loved seeing where Gary's mind went and what he cared about. His interactions with Captain Future were so funny and it was good fun to read. I think it lacked a little of your usual flair (which I say in the nicest way possible). I've been trying to put my finger on it and I think it's because there's so much more dialogue in this than usual and not as many descriptions. I think you write descriptions so well, and what I enjoy so much about your writing is that you can just go and describe a thing or a scene and make it interesting. But here I am comparing this to your other stories, which I probably shouldn't do. In it's own right it's great. This is a great, fun story to read. There were some ripper lines in this, and just going back and reading those lines now is enough to make me laugh. Your whole story is really clever, and just how little cracker lines can slip into it make it even better. Gary's character was so good, and I loved how much his character came through in this. All in all it was great fun to read, and brought a good laugh. This had me laughing out loud on multiple occasions! I absolutely loved reading this awesome story! Of course, it is acceptable for the magazine. Great job! "Don't Post Or Send Warning Computer"
This page was created in 0.4100 seconds.